Edwards-Councilor S150E48 Steramine sani-tabs are perfect for sanitizing food contact surfaces, which is essential in the food service industry. They can be used in either a soaking method for dishes, glasses, utensils and other small items, or in spray applications for sanitizing large surfaces like countertops, sinks, processing equipment, refrigerators, and other non-porous surfaces that frequently come in contact with food. When used as directed these tablets are highly effective at preventing the transmission of infectious diseases like HIV-1 (AIDS virus) and E. Coli. Prevent cross contamination to keep your food safe and your food establishment in business with these sani-tabs. Tablets are way easy to use- no measuring needed just drop them into the sink and good to go. Have had good results using these in our 3 compartment sink - they get the job done. Not only is this product significantly cheaper than the distributor I was using previously; but the packaging is much safer and durable. With a crew full of teenagers I need to make sure the products I use can take some hits. nothing bad i can say about these sanitizing tabs. They are a must to have a clean kitchen and pass inspection. The bottle is easy to read and the tablets are easy to use. These are easy and convenient to toss in our 3 basin sink. They seem to do a great job and we go through a lot of them. Love this product. I feel much more comfortable sanitizing my baking supplies with this compared to bleach or other solutions. I love that it takes up so little space but allows me to make however much sanitizing solution I need in just a few minutes. These sanitizer tablets are super easy to use for setting up your 3 compartment sinks in your commercial kitchen. There are a lot of other products you could use but I love that this one does not stain or bleach your clothing. Dissolves slowly in water (you can help it along by break up the tablets if you’re in a rush). Doesn’t seem to leave any residue when dry. Great price on these. They are triple the price at our normal distributor and this is the exact same item. Also works great for Sanitizing items as needed. I purchased these tablets to save on space from the large gallon containers. They are easy to use and are easy to measure. They are true to ppm when we test them, and we use them as a sanitizer for dishes, rags, and spraying tables. Steramine tablets for your 3rd sink. These things are great. No need to pour liquids into buckets mixing chemicals or anything. Just toss 1 tablet per gallon in your sink and run the water. Easy! These sanitizer tablets work great, the dissolve quickly in order for our towels to be sanitized to clean a table. I would highly recommend this product. Steramine sanitizing tablet. It’s a necessity in our food industry. It’ll last a long time. Together with the quat test make the health department happy. great looking product. this was exactly what I was looking for. great for a three compartment sink. I would definitely buy again. You will be glad you purchased this. These are perfect for my third sanitizer sink and these are the best price that I have found and I have done a lot of research. We had been using these sanitizer tablets after recommendation from another similar business. We like the convenience of them and the price from this site is great. Great value and works great! We used these to sanitize our 160 quart kettle we use to pop kettle corn. Meets our high standards of sanitizing and the health departments! Using these to clean my milking equipment, these take out the extra steps of washing with soapy water, rinsing, and rinsing again. All I have to do is take a bucket of hot water with one tablet in it and with one step, my equipment is clean and passes bacterial counts with flying colors. This a great sanitizer solution. You don’t have to worry about it staining your clothes if it splashes on to you. No strong odor. When tablets are dissolved, the water turns blue in color. My only complaint about this product is that it does take some time to dissolve. These sanitizing tabs are super easy to use! Just drop the prescribed amount in water, and they'll dissolve after just a couple of minutes, creating the perfect sanitizing solution. These tablets are quick, easy, and convenient for sanitizing the water. They are also cost efficient for small local bookstore - coffeeshop businesses like ours! Great product at a great price! Tablets make it super easy to have everyone use the correct amount every time! These dissolve quickly and are great for multiple uses. We use these everyday, and although they take forever to dissolve it works like magic. Plus your sink turns blue once it's sanitized which is cool. I'm happy with these sanitizer tablets because it makes it very easy for anyone on my staff to make a sanitizer bucket or fill the sink with sanitizing liquid. Just drop a tablet in the correct amount of water, allow to dissolve and you're all set. It does turn the water blue for a hot minute, but my towels have rinsed out just fine. these sanitizing tables work great. i was buying more expensive brand. the edwards-councilor brand more than half price i was paying for. i think do a better job. highly recommended it. Truly a must for all food vendors. The price is right and shipping is quick. Add this item to your order to always have an extra bottle on hand. We LOVE these sanitizing tablets. So much easier than the powder. Just drop one in the sink. They just take a little while to dissolve. A+++ product. These tablets are way easier to use than liquid sanitizer!! Our health inspector LOVED these! We will repurchase in the future as needed! Edwards-Councilor Steramine Sanitizing Tablets (Sanitabs) - 150/Bottle -- good sanitizing tablets, they do exactly what they're supposed to do. Will be purchasing more in the future. Great tablets! Time saving, incredibly easy, meet all the standards they need to, and don't leave any sort of film or overly chemical smell behind. We are ordering more already! These tablets take out a lot of the guess work when it comes to creating the proper ratio. They save time, and time is money. Health department approved this sanitizer. We are using it everyday and no issue. The blue dye can be uneven at time from tablet to tablet. We use these during our wash, rinse, sanitize in our triple bowl sink. They work great and keep our small wares sanitized appropriately. I like how you can buy them a bottle at a time or buy the case! Sanitizing Tablets. That's what they are. They do the job. They do it well. Every kitchen needs to sanitize and this is the perfect product. These sanitizer tablets are very easy to use and come in handy when you need to quickly pop them into the sink. Will continue to repurchase. Great value! these are about 1/3 the price of our local suppliers and do the job. Delivery has always been timely on multiple re-orders and we never have to worry about sanitary conditions. Much more convenient than measuring out liquids. Bottle is small, so it doesn't take up much room on the cleaning shelf either. And it's a decent deal too. We use these in our sanitizer buckets as well as in our glass wash sinks due to allergies to the other sanitizer packets. Easy on the hands that are always in sanitizer and cheaper through webstaurant than any of our local distributors for the exact same product. Bleach is, of course, cheaper but if you are required to use these they do their job. The only downside is that they turn everything blue. You can't go wrong by purchasing this product. It requires no measuring so it saves a lot of money. The price is amazing on Webstaurant. Super easy to use and would recommend this product to others! Use with the Quat test papers and you will be good to go with sanitized water! Works great. Never have to guess if we’re using enough sanitizer with this product just drop it in your water and it’s all good. Great price. This is a great product. I am a caterer and all my employees love when I use these. They get the job done. I would definitely recommend this product for anyone, anywhere and anytime. Wonderful product for weddings or any other special occasion for sanitation. These tablets are perfect for our use! We were so done with ruining all our clothes and aprons with bleach water. These tablets take all of the measuring and guesswork out of sanitizing. Just one tablet per gallon of water and you are good to go! This is the best price I've found on these tablets. We use them daily for making sanitizer water in our 3 bowl sink, as well as the sanitizer buckets that are out in our cafe. The go to sanitizing tables in the business. I am glad I am able to buy just one bottle at a time instead of a whole case. The store we purchased has been using these for years. Very easy to use so we continued to order them and use them. Our health inspector also recommends them as well. The absolute easiest way to have consistent sanitizer each time! We enjoy these because our employees simply cannot mess it up...they just drop the amount of tablets into our water buckets and BOOM, it's the perfect way to do it. I love the sanitizing pills makes it really easy just to drop a pill right into your sink or your bucket I would recommend these for any type restaurant . These Edward streamline tablets are perfect for sanitizing all kinds of things in a business! We use ours for sanitizing our spoons and even put it in a spray bottle to use around the store! It works excellent! We use these streamline sanitizer tablets are what you need in your three compartment for sanitizing. We just use one tablet each time so there is great value for money! These are health inspector approved in our county. Make sure you get the right test strips to go with them or you will have a violation waiting for you. These are convenient because you can just throw them in the water. This has become our standard use for dish sanitizing. Very easy to use- 8 tablets for a 3/4 full dish sink for us. It has actually cut my costs on buying sanitizer from our old hook up to a dispenser unit that seemed to never be adjusted correctly. We have been using these for years. Meets Health Department requirements and very easy to use. Easy to order, comes on time. Would definitely recommend. 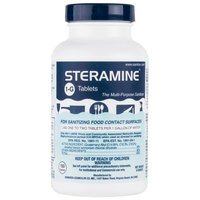 I have been purchasing this steramine tablet for a few years now from webstaurantstore. It is the best value I found online or from any broad-line distributor. These tablets are the ideal way to start the cleaning process in your kitchen. They break down easily and are set at a great price point for the amount. A must have if you serve the public. We use these in our bar sink. They are so easy to get the ratio right. Highly recommended! These are the best and most convenient way to sanitize our glasses. We've been using them since we opened and have never had an issue with them. These tablets are my favorite sanitizer product. They are super convenient, reliable and easy to measure, and super easy to store so that I can stock up. I just throw a few cases in one of those cheap plastic drawer stands and they fit right under my sinks. I am not crazy about the blue dye though, seems unnecessary, however, it has only ever permanently colored one cloth that was left in a brand new solution for 20 minutes or so. I have used these for years at my bakery. Very easy to use. Tablets no no need for measuring device. Health department loves seeing these. can be mixed for the 3 bay sink or use in a spray bottle to sanitize surfaces. Edwards-Councilor Steramine Sanitizing Tablets make sure my sanitizing water is right on target. You don't have to worry about mixing or measuring. Just pop a tablet in and it gets the job done. Works as advertised. One tablet per 1 gallon of water. My only con is I wish it would breakdown and dissolve quicker. Seems like there is always partial tablet sitting on the bottom of the sink. As anyone that has turned on the news would know, this has been a tough year for cold and flu--which is EXACTLY why I use this in the kitchen, on tables and chairs, etc. You can't ever be too safe! These sanitabs desolve quickly for near immediate use. The warmer your water is the quicker it will desolve. It will stain cloth so keep that in mind before using those white bar towels. We stained some of ours intentionally for quick identification of sanitation towels. Make sure you have some of these little sanitizing tablets around when the health inspector pays a visit. These are really easy to use and a great value! The sanitizing tablet smells great and helps us around the kitchen. It keeps our work space clean and tidy during the day and its not overwhelming. These steramine tablets work well. They last a long time. They take a few minutes to dissolve. I have notice they turn the cloths blue. I always use gloves when rinsing cloths. This is what you need to pass health inspection for sanitizing dishes in any bar or food establishment, including a food manufacturing plant. Your first sink is for soap, your second sink is to rinse the soap off, and the third sink has a couple of these tablets for every gallon of water. It turns the water a little bit blue. Soak the dishes in the blue water for 30 seconds and you will stop the spread of all illnesses, including HIV virus. Great Price for this product. same old sanitizer at not the same old price. Great value. Very fast shipment. I will recommend this product to everyone. Blue sanitizer tablets. They work great for my store. It has the measurements on it for the sink size. I recommend these for your business. I really like this product. I use 4 tablets per sink, so the bottle lasts pretty long. The dishes always seem to come out clearer and brighter after being dipped in this solution. These Sanitizer tabs are amazing, much easier on my hand than bleach. I like the blue tint so I know its the sanitizer and not water. 3/4 gallons of water treated with one tablet of Edwards-Councilor sanitizer. This is much easier to use than mixing bleach and water, and it doesn't have an odor like bleach does. we ordered these instead of having to use liquid bleach. This is accepted by the health department and is more convenient, just toss the required amount in and go. This product takes the guess work of setiting up your sinks. Drop one tablet in on of the three compartment sink and that’s it. It come 150 tabs in a bottle and 6 bottles per case great vaule. Love this product! Did you know that you can use this (when mixed with water) to clean your cutting and eating surfaces? The product does double duty and Webstaurant has the best price I've found on it so far. The Edwards-Councilor Steramine Santitizing Tablets allows you to make santitizer easily. It is easy on the hands and is inexpensive. I would recommend this for any commercial restaurant. For a necessity in the kitchen, not only do these get the job done, this is the most affordable route we have found. We would highly recommend. These sanitizing tablets are an easy and economical way to sanitize your dishes. Simply drop a tablet into your sink of water and you're ready to sanitize your dishes. What can I say...LOVE! LOVE! LOVE!. It sanitizes great. No more having to measure out a liquid sanitizer. I was scared to buy the case but I am glad I did. These Steramine sanitizing tablets are easy to use, dissolve quickly in hot water, and do a great job sanitizing the dishes without leaving a residue! Work as intended! Love the blue tint on these since we use them on our fast casual line to hold our knives in between use. Since we started using these tablets we have yet to receive a complaint of any customers succumbing to food-borne illnesses stemming from improper dish sanitization. They are easy to use, but they can be a bit cantankerous to dissolve. Best tablets ever, love em, get em. They make your dishes very clean and shinny. You can test the sanitizer with a QUAT test strips. These sanititizing tablets work great in the kitchen. I love the shade of blue that they turn the water. It makes it easy to identify which sink is which. I use these tabs in my triple sink. They dye the water blue so it's easy to tell if the dishwasher is not using them. Good product. These sanitizer tablets are perfect for our third sink. I like that they change the color of the water so my frazzled brain doesn't have to remember whether I've added sanitizer. Another plus- this sanitizer does not leave streaks on our dishes when dried. These tablets were conveniently available in a case and a case lasts us a long time. The product is easy to use and we will reorder when necessary. I love having warm water sanitation strips. Some sanitizers need cold water, and with this our dishes dry faster. The tablets dissolve quickly and with the right ratio leave no residue. These tablets make making sanitizer for the kitchen and catering setups a breeze. Put 1 -2 tablets per gallon of water and you have a sanitizing solution you can use for surfaces and dishes. The tablets are priced well, not as cheap as using bleach, but they work great and easy to transport. Easy to use tablets save you from having to mix chemicals. Consistent results each time. Versatile enough to use as a rinse or a spray around the shop. Every step you can take in sanitizing is a good investment. We've used these in a lot of different ways. The application we have for it most often is for dish towels or bar rags. The dye will turn a white towel light blue, but does it matter, as long as it's clean and you can trust it? Good product. The price is so much better then what the food companies charge on this. It's the same stuff, just a quarter of the price, thank you! These sanitizing tablets are great for the kitchen. They dissolve easily in warm water and color it a nice shade of blue. We use a couple in our sanitizing soaks. I love the convenience of these sanitizer tablets. Just fill up the sink and throw a couple in. But after a couple cases worth of using these, I am thinking about switching back to regular liquid sanitizer due to the significant cost difference. if cost is not a factor for you, these are fantastic. work great, pass the strip test every time. also, unlike some tablets on the market which do not color the water, this one colors the water a nice blue color, feel reassuring. previous brand we were using did not dye the water any color. work as great as any expensive ecolab or other brands! These sanitizing tablets are great for the on the go caterer or food truck. We use them to keep our area clean and compliant with health department standards. Its a less expensive alternative to liquid sanitizing solutions. I would buy this item again. This is a great product for any company to use during clean up and prep work. The bottle includes 150 tablets that makes up to 150 gallons of product which is a lot! I would highly recommend! Love this stuff! It mixes well and doesn't make you hand smell like bleach when using it in the third sink. I like that it's blue and easy to see because I have had employees forget to add the clear stuff before. Quick and easy way to insure your third sink meet all health regulations for hand dishwashing. Tablets will take about 5-10 minutes to fully dissolve in hot water. It save us a lot of space since it's in a compact bottle. Definitely will buy again. The steramine sanitizer tablets make it SUPER easy to clean/ sanitize our bar. We use it for cleaning buckets, growler cleaners, and even our utensils. This product is great, it is easy to use and ensures we have perfect sanitizing solution everytime. You just use one tablet per gallon of water amd your ready to go. I've been to other supply stores for sanitizing tablets, I absolutely love the price point for these and they work awesome !! I would totally recommend these !! Great price, and great product. Everyone I know that has a commercial kitchen swears by this stuff and loves it for its convenience and quantity. These are great tablets. I rent out my kitchen to other small busnesses and wanted something that was easy for everyone to use. Also no mess involved, this is a great easy product to keep you kithcen properly sanitized. The tables were so confusing. The instructions say to use 1-2 tablets per gallon of water.....but no matter how many I used, they would not register on a test strip. Also, the tables don't dissolve. I had to crush them with my hands every time. They also turn the water blue and will stain rags/towels. Not recommended. I purchased a case of these tables and have changed to a different sanitizer after just one week. The Edwards Councilor S150E48 Streramine stabilizers do the job. The directions and description on the label are clear. These sanitabs dissolve well and are a great price. Works great, easy to use. Just mix one tablet per gallon of water. Be sure to order correct test strips, I accidentally ordered the chlorine ones. These are our favorite sanitizing tablets to use in our sanitizing tub. They work amazingly and I feel like they get our dishes so clean. This sanitizer is very easy to use and store. We had been buying it locally for three times the price until I found it at Webrestaurant! Well worth the cost. My students don't have to guess how much sanitizer to put in our 3 compartment sinks anymore so, therefore, I KNOW the dishes are being sanitized properly when they are hand washed. Stearamine is our sanitizer of choice. We add 6 tablets every morning to the sink bay with an inch or 2 of hot water. After they dissolve we fill to our level that meets the 200 ppm. These sanitize tablets are great! We have been using them for years and love them. We recommend these not only for the quality, but also because the price is great! These Edwards-Councilor Steramine Sanitizing Tablets work great! Economical to use and insures that your pots, pans, plates, glasses and utensils are germ free. Wash, rinse and SANITIZE. Amazing product. I started use this chemical and can not stop use. It Clears glass so fast and removes water drop on surfaces after apply. Sure to buy again. Strongly recommend. I'm kind of mixed on these items. While I'm sure they do their job quite well at sanitizing, they can kind of be rather rough on the skin. They are also really expensive compared to just using bleach. Great product and easy to use. Drop 1 or 2 tablets in each gallon of hot water to make a sterile solution to wipe counters and sanitize dishes and utensils. The sanitizer tablets are awesome. They make it easy to get and maintain the proper sanitizer levels safe for your restaurant or home. I will be buying them again! These tablets are so fast and convenient because they are already pre-measured for you. They dissolve quickly and easily just like they are supposed to. What a great value considering you get 150 tablets in each bottle, enough to do 75-150 gallons, depending on whether you add one or two tablets in each gallon. Super easy to use sanitizer tablets that work well, and don't irritate the skin too easily, although the packaging recommends wearing gloves. No measuring required. Good value for these. We use these daily to sanitize our dishes. Make sure to wear gloves as these (as well as any other sanitizing solution) are hard on your hands. These tablets are quite easily one of the most useful products we didn't know about prior to starting our shop! Easily and consistently create a solution that can be used for spray bottles or the "sanitize" compartment of your three-compartment sink that the health department will be confident in! I have never used these sanitizing tablets befor but I watched a user submitted video on Webstaurantstore and saw how easy they were to use. Thanks to the video I love using these. Dissolve one tab in a gallon of water and you have a terrific bucket of sanitizer thst you can drop anything into. I use mostly for silverware and I have had great results. So this is my first time purchasing or even using this product. I thought only one bottle of 150 came with the purchase so when I received 6 bottles and realized I read it wrong I was supper happy. This will last me all year being supper liberal with it. I love fix cost in this business that go a long way this equals out to .027 cents a tablet. Wish everything was that cheap. Lol. I also like that I'm not measuring out any magic potions that will erritate my skin every day. Just drop the tablets into water and done. Love it. These are good for the dishwasher. He has a certain amount of tablets to put into the dishwasher to properly sanitize the dishes. The product does last. We use these tablets in our 3 compartment sink and they are much more convenient than using liquid sanitizer. We just drop in two tablets and fill the sink with hot water until we reach the correct dilution. Being a distributor, I sell to many local restaurants. When I buy in bulk, I can sell to them at a much lower cost than even I can get from the manufacture. These do the job intended. Long lasting sanitizer tablets. 150 in one bottle will last, our restaurant about two months and with 6 in a box it's a great price. the steramine sanitizer tablets are exactly what i needed in my restuarant. Webstraunt has highly competitive pricing and i recommend this product to everyone that needs the tablets. This bottle of 150 sani-tabs is perfect for a bar or restaurant looking for a low cost and easy to use sanitizer solution. These also come in a case of 6 is you're looking to save some money. Great blue tablet that really work well for sanitizing, would recommend them to all restraunts, they even take away aids from surfaces, powerful stuff that works! These are very easy to use sanitizing tablets. It takes the guesswork out of using the right amount of sanitizer and overall it is a good value! These are so convenient and easy for our bar/restaurant. This is the cheapest price we have found for these tablets so far as well! We are very pleased with this product. Super great and easy to use sanitizing tablets. I'm using them in my Noble spray bottles and little 3 qt pails. Turns your water blue, and you're set to go! Hard to beat their price here at webrestaurant.com. We use these tabs in our buckets when cleaning the restaurant throughout the day. They do exactly as described and are easy to use. No complaints. Steramine sanitizing tablets are perfect for basic cleaning and sanitizing. They are great for surface cleaning, dishes, and sanitizing equipment throughout the day and at closing time. These tabs are very handy. They work very well. The bottles are easy to store and tuck away. Only use 3-4 tablets per round so this bottle lasts forever! I have gone online to compare the competitors' price against the Webstaurantstore's price and each one fell short. I am very pleased to have purchased this item and even more pleased to get two. You cannot beat the amount for the price and I will be ordering more soon. They perform well and the visit from the health inspector was a success because I received this item sooner than expected. This is a great product. Does not cause skin reactions like some of the other sanitizers we have used. The price is a good value. I will be order more! If you need to make sure your stuff is cleaned up to snuff than look no further than this item of sanitization. It does the trick. Must have for bar 3 sink setup. I bought the 6 box set and it's been over a yaer still have a few bottles. Gets the job done and passes inspection. Perfect sanitizing tabs at the perfect price. No need to worry about not having to right amount. We have spent double on sanitizing tabs, but these are the way to go! All I can say is this is great, we set it up first thing in the morning, and change it every 4 hours as needed. We love knowing how great and easy it's working. My dishwasher has a sanitizing cycle but I'd rather wash certain items by hand. I'm extra picky about food cleanliness and wanted a way to get that same clean by hand. This helps to do that. Makes the calculation of sanitizer to water ratio really simple. Just follow the directions and test your water and everything should be well with in requirements. Love Love Love how simple and easy these are to use! Just plop a tablet into water, and when ready the water will be blue. No hassle. These sanitizer tablets work great. They are easy to use and don't break up easily, so when you actually get the bottle they are not in a million pieces. easy one tablet to a gallon standard works great for event and mobile catering when large dispensers are just not possible. The small bottle is much more portable and limited storage friendly. These are great because they last longer. Next time i would order them along with a spray bottle for easier use. They are affordable and good quality. I've been using these for 5 years in my bar sink, easily the best sanitizer tablet on the market and the health inspectors love the brand also, the price here at webstaurant is great! What a great product for easily getting the correct sanitizer level in our dish-washing area! the blue color makes it impossible to forget, and we love that. Way better than bleach for sanitizing dishes and surfaces. These will temporarily turn rags blue so be aware of that. We use these all the time in the 3 bay sinks, bleach bucket, and mop bucket. Health department approved! These are very accurate and are good quality sanitizer tablets! Easy to follow instructions, 1 tablet per gallon. Great product and will order again. These are the same sani tabs I was purchasing through my food distributor and they were costing me more money. I will continue to purchase. A staple in the kitchen and bar business. Easy to use and priced right. They are small and compact for easy storage and don't cause messes like liquid sanitizers. The large pack of bottled tablets is very convenient. By being able to order the large pack you are stocked for a while. The tablets are easy and quick to use. Work perfectly, just had to figure out the concentration we needed for our sinks and it came to about 2 tablets per sink of water. These are cost effective. Best price we found for them. Great product, easy to use inexpensive and great for outdoor events and catering. They can be a bit annoying to dissolve, but they work wonders. I find these steramine sanitizing tabs to be effective to sanitize my three compartment sink before and after use. It's easy to spray on a solution to the sink. We bought these for our bar, and they are excellent for the cost. You will only use one of these at a time, and maybe go through a couple or a few on busy nights. For a box of 6 bottles these are not too expensive and will last a while! These tablets make sanitizing our steam table a breeze. They are easy to use and I like the quantity that a case contains. It is a real value. I turned these tablets into liquid so I can sanitize my tables for customers to eat. It's easy to use and there aren't any unpleasant chemical odors. These are great! I use these tabs all the time they dissolve quickly they are convenient I recommend this product to everyone they are quick and reliable this is my number one choice. needing to have a new sanitizer for every day in your sinks and for cleaning, these are great. no measuring and the price is great. Much preferred over the liquid solution, very convenient. Two tabs work great for our smaller sink and dissolve pretty quickly. Would buy again without hesitation. I very much like this tablet version of quat sanitizer. Super easy to measure and don't really have to worry about over portioning and wasting. Also useful since we have a smaller size sink so we could easily the amount. Well priced and lasts us a while. Product is used how it's described, and works like it's suppose too, Health Department was happy to see this bottle on our shelf next to our cleaning station. Great price for a product that we use in our bars daily. These sani tabs are the only ones I have ever used and will continue to use. These tablets are quick and easy to use- you just drop them in your sink and they'll dissolve. I disagree with another reviewer that says you need to wear gloves. I can understand the safety precaution, but my employees and I have been sanitizing glasses with bare hands for years using these tablets, and we've never had a problem. Our kitchen needed something easy to use and these tablets are easy to store and use. The only downside is you need to wear gloves and be careful of skin contact. These steramine sanitizing tablets dissolve quickly in warm water. I use in both a triple sink and in a spray bottle for tabletop use. The small container size is perfect for me having limited storage. These sanitizer tablets are a life-saver! Instead of always having to measure how much to put in, my staff can just throw a tablet in and I never have to worry about checking the levels. Love these sanitizing tablets. They dissolve fairly quickly and we haven't had any problems with them staining. Good knowing our water is sanitizing our dishware. I bought these tablets because I didn't want employees guessing how much solution to use. For our sink, we need about 2 or 3 tablets, so one bottle lasts us a long time. In the past, we have used sanitizing tablets in squirt bottles for ease of use. We purchased these Steramine sanitizing tablets to put in the new Continental 32oz. bottles we purchased through WS. We use other cleaning agents like vinegar and peroxide and this one will go next to them. You can also use it to place in mopping water OR sink water for food equipment. Great purchase when buying in bulk. These tabs will last a very long time before we need to reorder again. Very convenient buying them by the case. These tablets work great and are priced well below my local restaurant equipment place. The tablets are easy to use and instructions are easy to follow. Works great and dissolves completely in warm and cold water without need for external agitation. Also works well in a spray bottle to wipe down equipment and countertops. Make sure you get test strips to verify final concentration. Great product to carry! Comes in handy for an alternative to bleach or bleach tablets, will stain white towels though, but I keep those towels just for sanitizing. We use these sanitizer tabs all the time. Easy to use, just pop one in the rinse sink water and dishes are sanitized. Great and useful. A lot easier to use than the liquid sani. Saves on waste and it works well with the health department. Saves me from having to buy them all the time because you only need a few tablets. Cannot believe the price for these. I was paying far more a bottle for these sanitizer tablets. Finding them at this price was a great surprise. These sanitation tablets are a great alternative to bleach. They have no scent and don't stain. I would suggest to anyone using them to crush up the tablets first to make them dissolve faster. The sanitizer tablets as nicely held in this pill shaped bottle. Although some of the very last pills may be crushed towards the bottom of the bottle. Love these for my home cosmetics formulation workshop and utensils.. Following the directions, I wash with warm soapy water, rinse, and then soak my utensils and tools in the solution for the allotted time.. The fact that everything can air dry and remain non-toxic is utopian! No noxious smell, no abraded skin on my hands, and I even use these tabs in my spray mop for interim cleaning.. I use them in a bottle for hard surface sanitizing around the kitchen and bathroom, too.. These have surpassed my expectations in terms of ease of use and reliability.. I need to ensure my equipment is sanitary and these are an essential part of my strategy.. Love, love, love these.. These tablets are so easy to use! They dissolve well in hot water, and the water turns a really pretty blue color that shows you it's working. We also bought the Noble test strips to measure it's effectiveness. Easy to use sanitizer tabs for soaking solution to keep our church in compliance with food safety regulations, after hand-washing and rinsing utensils, plates, bowls, and cups. And the ordering process is quick and easy too! The packaging is great on this product and the product itself is great. Much cheaper than the liquid versions available and gets the water to the right ppm quickly and lasts for very long time. We use these in our sanitation buckets and our sink. They dissolve quickly. The blue color will stain your rags but not your hands. I dont find this to be a problem since i use the same rags after laundering. We use this to wash dishes in our food truck. At first I was unsure because it turned the water blue but it ended up working great and we use it on a daily basis. i really recommend you this sanitizing. I use it for sanitizing the cutting board and the knifes. Its very easy to use and its very practical use tablets instead of liquid. This is the only sanitizer tablet I can use that does not irritate my hands. It also does not take as many tablets to reach the 200-300ppm level of sanitizing. Plus you also can't beat the price. We use these sanitizer tablets daily in our rinse water. They do an amazing job of sterilizing the dishes used in the deli. We also put some in spray bottles to use when cleaning tables, meat slicer, and counters. These does the job for the fraction of the price! I use these to make my own spray bottle sanitizer and to fill our sanitizer buckets for the line. Did I say these are the cheapest ones Ive found. Very happy with this purchase. This price is much better than what I've seen elsewhere or from my food purveyors. The sanitizer tabs are perfect for effortlessly figuring the amount needed for the sinks. We use them for both our 3 compartment sinks- one for large pots and pans and one for our bar glasses. The health department requires this method to be used for washing anything that can't be washed in the dishwasher, so this is a perfectly easy effortless way to use that method. Great Sani-tabs, typically we used liquid, but these are much more convenient, cheaper to ship and they work better in my opinion, just drop a few in room temp water and you're good to go. They work perfectly. A better option than using bleach and much better on our hands. Love that they are tablets and you just drop a few in and you are good to go. These tablets are worth every penny. We have a large restaurant and the process of testing each sani-bucket to ensure the correct mixture is very difficult. With this product, all staff needs to do is drop one or two tablets in (depending on size of sani-bucket) and you can relax knowing that you are food code compliant. The water turns blue, which is a quick and easy indication of whether the staff has done their work correctly. In a recent health inspection, we had a dozen sani-buckets tested and each one was well within the acceptable range - that alone makes the product worthwhile. This steramine sanitizer is great. It is very easy to use, just drop the tablets in water and you are all set. No fuss, no mess and no measuring. Purchased the Steramine Sanitizer tablets the convenient bottle of 150. They are very convenient to use and get the job done without containing bleach. A great value for the price. Everyone really likes the blue color of the water....like that makes a difference. Whatever keeps the crew happy! These sanitizer tabs for our bar are WAY cheaper than the same thing from our local food distributor.....even with shipping. They work just fine. We purchased the test paper from Webstaurant Store also. A good product at a reduced price. It is nice to have the convenience of dropping a tablet in the dish water and not measuring liquid. However, it can leave a heavy residue if not rinsed thoroughly! We bought these to have as a backup and in the case of an emergency they would provide that relief just fine. Easy to use, easy to measure! These tabs are perfect for any sanitizer sink! The easy to read test strips make it easy to check proper levels too! These tablets are great. We just drop them into the sanitizing tub, let them dissolve and never worry about the right concentration. They are so easy even I can get the basin setup correctly!! Good working product that we use for all our dishwashing. The technology is getting a little old as there are more advanced chemicals these days, but this is great for a backup and doesn't take up a lot of space. These are great for use in my kitchen. There is no measuring out liquid sanitizer and hoping your employee got it right. It does leave a residue on the dishes though. These streamline sanitizing tablets really surprised me, they are really easy to use. These tablets work great with the qt-10 testing strips. So easy don't think I will bother to look for a replacement. These tablets reduce waste and work great!! Excellent for sanitizing and way easier than trying to use the correct amount of chlorine bleach. Very happy with this product and will be reordering. the least expensive and long lasting sanitizing method i have ever used. i also love how you can tell that the water is sterilized when it turns to a light blue. there are other sanitiziers that do not change color at all. I got these on a whim just because they're cheap and thought 'hey, if they work, they'll be a great (cheap) alternative to what we have now'. Well let me tell you: they work! The test strip showed just the concentration it should. These also dye the water a light blue so you know the water has sanitizer in it - a nice touch. They do take a bit to dissolve (~10 mins) but it's an easy thing to start in the morning: come in, start your buckets and by the time anything has heated up, they're done and you throw in your towels and get to work. The cheapest way to sanitize! Nice light blue color, so you know it's not just plain water. You can split the tablets and make a half-gallon for a spray bottle, too. Excellent sanitizer tablets for a fraction of the cost of what I have been paying from my other distributor. The Board of Health in our area loves that we use these and you can get the test strips from Webstaurant store as well. Ha! Gotta have these! I wasn't sure where to buy these in my new town, so i just threw them into my cart here at webstaurant. I love this place! Excellent product. The tablets have slightly less strength then the ones we get from our distributor. This allows to wary the strength of the water and allows us to save money. Love these sanitizer tablets. They are super convenient and get the job done in no time! I highly recommend these to anyone who uses sanitizer! this is one of the only sanitizer that we were able to find that does not contain bleach, we've been using them for years and are very happy with it. The tablets are also easy to dose. Wow! Talk about easy. No measuring out liquid or powder any longer. Just drop a pill in the sanitizer bucket and add water. Simple and cost effective. I thought I would use these for a more non toxic option for sanitizing (we were using bleach prior), but was not happy with them. They were nicer on hands and didn't run the risk of staining clothes but it takes about 6 tablets to get a small compartment sink full of water up to the right dilution. They also hardly ever dissolve all the way. These are a must and are only half the usual price of many other distributors here. They usually set me back a bit per bottle but here its less. These tablets have worked exactly as described in my kitchen. They dissolve in hot water, and the container comes filled to the brim with tablets. Definitely great value for the price. We use the sanitizer tablets in the 3 compartment sink as required by the health department. We use 2-3 tablet each time to reach the recommended sanitizing level. These tablets work great! They turn the water blue which is great because when it dries you can tell if your dishes or supplies were properly draining or not. If they properly drained it leaves no residue and no taste, unlike other sterilizers. But if they did not drain correctly you will see dried blue residue. I would definitely recommend this product. Easy to use and foolproof, fill sink to exact marked level and put in exact amount of tablets. Best thing since slice bread. Directions easy to follow. Passes with the health department. Not to mention great price. Would recommend to someone who doesn't want to pay for a service. These sanitizer tablets are very easy to use. They will last an entire day's use without needing to be emptied and filled again. We hand wash every glass and these tablets do a great job. Found these on this site and they offer more tablets per bottle and they were way cheaper than our vendor! Glad I found these on this site. I absolutely love this product. We use it mainly in our sanitizing bin. But we also use it to sanitize surfaces and doorknobs during the day. Our health inspector did not know if we could use this in NY State, she came back after her research and gave us full clearance. These things sanitize! I use six in my third compartment of my sink and get a good reading from a test strip every time. Buy them! A must have for any mobile food service enterprise. Quick, easy to use, and effective, all at a price that can't be beat. We use them primarily for on-site catering events where the environment really needs simple solution products like these. These sanitizer tablets work great, dissolve quickly in hot water and don't irritate your skin. The bottle doesn't take up much room and they don't give off any chemical type odor. Great product. Im not sure what a gallon of sanitizer goes for in your neck of the woods, but here in NYC... we pay more for a single gallon than what these Sanitabs cost for 150... which BTW makes 150 gallons of Sanitizing Solution. Around here a gallon is $6.99 or so... thats almost $1000 if I were to buy 150 gallons... the same amount one bottle of the Sanitabs would make. Cha Ching!!! Saving money on Webstaurant is making money! The best sanitizer I've found so far. Tablets are quick to dissolve and, unlike others in tablet form, do not leave grit in the bottom of your container or have a heavy, harsh chemical smell. this sanitizer tablet is a must have around the kitchen. you know its safe to use after wash. great price for a great product. also shipped super fast. Very easy to store above the sink and use as needed. No hassle and sanitizes perfectly. Even used it for a street fair in the sanitize bucket. Great product! Easy to store and convenient to use, I'm not sure we'll ever use anything else. Especially nice for our food truck, where chemical storage isn't always the easiest to accommodate. Thank for a great prodcut! Each tablet gives you a gallon of sanitizer. No residue, no odor. 150 gallons of sanitizer for such a low price; I have been spending way too much money on leading brands at department stores for far too long. This great value cleaning product should last a long time and work well to help us keep dishes, counters, and food service areas more sanitary. Perfect for consistency in measurements. Not as messy as having to deal with liquid sanitizing agents. My local health department recommends it as well, so it is a great buy for me! this is a small bottle but indeed has 150 count of tablets and they works great for sanitizing some old bottles for use in next round of shampoos, body washes, and hand soaps. it doesn't take a lot of space to store the bottle and the price is not bad and shipping is also affordable - great buy. Great price and easy to use. just throw a couple into your hot water and...kaplow!! It's done. Thank you for giving us a great product. Exactly as website described, and cheaper than the supply store by me that is often out of them. Will be buying from them again ! Great product, makes sanitizing easy and simple. Six pack also lowers price to make sanitizing inexpensive too. All you have to do is add to water in last sink compartment. I have used these for sanitizing in the past. I like the fact that the these quats are not as hard on people\\'s hands as chlorine. Works well as a spray sanitizer too. This is a convenient sanitizer for small operations. It works very well and is always stocked up at the restaurant. Hot water is needed to use this. This stuff is a good inexpensive way to keep things clean. The size is reasonable for a small operation as we only use a could tablets a day. They dissolve fairly quickly and you can use it in the spray bottles for sanitizer. Works as described. Need to be warm water to be able to dissolve the pills. Cold water don't work. No smell. Dries hand if you use the water often. Great product for sanitizing my pans, pots and any dinnerware used. So simple to use and doesn't leave any order or discoloring behind. Bought 3 to always have on hand. One tablet per gallon means one bottle will go a long way. Once mixed with water the sanitizing liquid does not break down easily, so it will last well. Great for washing glasses and leaves no streaks, glasses are very clean and fresh, absorbs quickly in warm water. We always receive good comments on our super clean glasses. These sanitizing tablets work great. No mess as with bleach. They dissolve quickly and the health departments like them. Just drop them into a bucket of water! Best price from any where I have searched online and in town. The dishes and pans seem to dry faster using these tablets and tends to reduce spotting. GREAT value. These tabs dissolve very well, but sometimes when we are in a hurry, we will crush the tabs in the sink before running the water. Either way is good! These tablets are perfect for that 3rd bay of your sink for that final rinse or in a bucket for towels. Our health inspector said they were exactly what we needed. Absolute No Brainer. We save $30 per week using tablets versus the wall mount unit installed by a service provider. It comes with strips in every box so testing is always easy. We are happy with our purchase of these sanitizer tablets. They work very well. They are easy to use. They are packaged well. We would recommend them. Steramine Sanitizer Tablets are an excellent product, highly recommend. Used them in my small café and it is great for sanitizing. Inspectors love to see these. very good sanitizing tablets. We loved using these. This has to be the best website that I have found. So much to choose from and at such great prices. We have used these tablets for 4 years and they work very well, and are very easy to use. Just mark a line inside your sink or bucket and show how many tablets are required, then anyone can add water to that line and throw in the correct number of tablets. Tablets are much easier to use than having to measure liquid sanitizer. Just fill the sink to the appropriate level and add the correct number of tablets. Best price for this product that every food service place needs. We could not find this anywhere for less. Plus we always get great service. We have been using the powered type sanitizer with good results, but these should be cheaper and I like the blue color these tabs make so you know the product is in the sink by just looking. These tablets are the best option for sanitizing dishes. All you have to do is drop the tablet in he sink. We even use this to sanitize tables. Was Skeptical at first when we purchased this item. Turns out it works out great. We fill our sanitize sink drop two tablets in the hot water wait for them to dissolve (pretty quick), and we are ready for the whole wash, rinse, sanitize. Will be ordering more. These tabs have made it eaiser for our staff to measure the correct amount of sanitizer for the sinks and cleaning bottles. Before we had the bucket of liquid and went thru much more than needed. Now our staff can all just throw in x amount of tabs instead of trying to measure out ounces of liquid. The only drawback is we are so used to the pink colored sanitizer. We previously used bleach for our santizing needs. Started using Steramine tablets several weeks ago and am a convert. Easy to measure and no need to repeat rinsing. i relaly love these tabs so much. make sanitizing and cleaning so much easier. our health inspectors love them too, at least in my area. I was expecting a huge bulky box, but the 900 bills fit in a shoe size box and they are what we needed to make sure the restaurant is clean ALL THE TIME, THANKS!!! These are easy to use, you dont have to measure out the right amount. The only down side is they tend to turn our white bar towels blue permanently. I used to buy the nu-foam tablets before I accidentely bought the steramine tablets,they work the same and have 50 more tablets per bottle,thats a deal I could not pass on. The 6 bottle count box of Steramine Sanitzer Tablets is not only a must have and is also a great value. Much less expensive that everyone else selling it. I got these Tablets on sale at a price that couldn't be beat! The storage space that these take up pails in comparison to gallon sized sanitizers. We started using these Stermine tablets as an extra level of safety in the dish washing process. The application is super easy just fill the third sink, drop in a couple of tablets and proceed as usual. Does what it is supposed too with out any odor either. Leaves no sticky film on our flat wear or cups. Does not leave any film in the sink either. We use these at home in our kitchen to keep everything clean and sanitized. We use these mostly when somebody is sick, they're really great for a germ free environment. this sanitizer is a quick money saver!!! this is something we have to purchase for safety reasons and though it does not produce revenue, it certainly helps me keep my tables clean and sanitized! Good sanitizer tablets for the price. Cheaper than ordering them through other distributors. Doesn't leave a film on the glass, and have a nice clean feeling once they've been washed. These tabs work just as they should. I was quit pleased to find them on this site not only for their convenience, but because even with the shipping they are significantly less expensive than purchasing a similar product at GFS. Sanitizing stapler for INSPECTION time. We have used these in our restaurants since we opened and its a quick toss in the bucket and a nice swirl to dilute it. I am trying to get more of my clients to use this marvelous product. From what I understand, they kill micro-organisms such as E. Coli, Staph, and HIV-1, if the glassware, etc. is exposed to this product as a final rinse for at least 1 minute. How fabulous this is! We have to use these per the health department and they are super easy to use. Drop a tablet and fill and you're done. No smell, light blue color. great product saved us alot of money using the tabs instead of the liquid. The case of our liquid is the about the same price as the tabs but each bottle of tabs is equal to 4 of our bottle. We had ordered these quat tablets from my food supplier and found them on Webstaurant for half the price! Great value at a great price. This is the best stuff for sanitizing. No smell or irritaion for hands, etc. Doesn't stain or leave a taste. They are so nice to drop in as many as you need. We have only a few dishes to wash daily but these tabs help take the guess work out of the sanitizing. We've found right amount of water/tabs for the sink and now its as simple as dropping the tabs in. Love it. Really convenient product to have! Takes all the guess work out of measuring sanitizer strength for dishes, buckets, etc. You definitely want to keep test strips on hand still, but this makes easy work of day to day sanitizer needs. One case will last a pretty reasonable amount of time. Really great for off-site use. Just grab a bottle or as many tablets as needed, and go. Highly recommended product. what a great product. just one pill per one gallon of water that is easy. no over using that helps. it will make your job easer. These tablets are great as a substitute for the typical sanitizing liquid! They dissolve easily and are easy to get the proper strength needed!! Will last a long time!! Great price for a great product. I use these every day in our store and they are very good. They are a better deal here than in other places I have considered. Typical sanitizer tabs. They get job done, and they don't smell as bad as some we've used in past. They are a good deal at this price. We'll order more! low cost effective sanitizing tablets.. they take a bit to disolve but meet the requirements for local health codes. dont forget test strips if needed. Small size is great space saver. larger resteraunts may have more effective solutions, but for outr small cafe it is perfect. These sanitizing tablets are very easy to use. Just add one tablet per gallon of water. It can't get much easier than that; and the item is a must have. These are probably the easiest method. Very easy to use and works great if you purchase the test strips made for these to be sure you have the right amount. I cant beleive the price on the sanitizer tablets. They are less then half of what we would pay for liquid sanitizer in our 3rd sink. Even though they turn the water blue they have no taste even if you were to serve a water out of a glass still wet with this product. Highly Recommend. Works really well in our large three bowl sink. The employess like that it is easy to use. Just count out the correct number of tablets and drop them in. I have look else where for these tablets and was blown away buy the price. Always a good choice here best sanitizing tablet out there for a great price. We've been using this sanitizer almost a year in our deli, and it's so easy and nice to know it's thoroughly doing the job right! This is a great product. I bought after watching the video on the Webstaurant webpage and learned how easy it is to use. Saves time and effort! These tabs are wonderful because once you learn how many tabs are need to make the correct sanitation formula in your sink there is no more measuring! Although slightly more expensive than bleach, it is not as abrasive and does not have the overwhelming smell that bleach has. We build and sell concession trailers and trucks, these are the tabs we include in our "turn key" business package with each sale. Health inspectors LOVE LOVE LOVE to see these. They work great for spraying down work areas thru out the day, but work even better for the sanitize portion of the sink as the solution. They take the guess work out. Great product, and great price from Websturant! What can I say.The price on these is hard too beat and in fact no other supplier could come close the the websturant price.And this is a much better alternative to the stuff already mixed and bottled kind for countertop sanitizing. The price is right and it is something that you have to have in the restaurant business. The health department checks for this on each visit. Nice to have plenty in stock. These tablets are super easy to use for dishwasing as well as disinfecting counters and tables. Use with the testing tablets and they make the perfect disinfecting pair. These tablets work great in our triple sink. I love the way they fizz away so I dont have to worry about them dissolving. I also have gotten used to the blue tint. I can tell just by the color if our solution is on target. These tablets are great. Very easy to use, just drop in, no measuring involved. We found the exact same thing from a local supplier for way more, this is definitely a great buy. We all know how we need to use steramine to meet codes, it does work well but the price through webstaurant is just great, place these in an order and they ship for next to nothing. I love the case price along with the easy of the tablet. No over use is happening with the bartenders because it's not a powder. These are the same product that I was purchasing from a local supplier for almost 2 times the cost! Will continue to purchase these through the webstaurant store! This product is simple and easy to use. Just put the tablets in the sink and fill with water. They couldn't have made it any easier. I also like that the water turns blue. This way I know my employees have added the sanitizer. Straws are clear and individually wrapped in white paper which helps to keep them clean. Fits great in the travel lid. Haven't had any broken in the middle or unable to be used. Great value for the money - easy to use, easy to store. Exactly what we needed for our mobile catering business. Will definitely be reordering these in the future. The only way to buy this product. I have priced it at supply stores by the single bottle, and by buying the 6 bottles in the case I am saving a lot of money. A cost saving with these. We were purchasing them from a local supplier and at a higher cost. Purchasing the case from Webstaurant was a real cost. Excellent price,extremely fast shipping!! Why waste time and gas going to supply store. Webstaurant store has everything I need at a great price and dependable delivery !! Love the individual bottles - my employee accidentally dropped the whole container in there (ouch), but the lid was closed so we didn't lose any tablets! Our department of ag inspector approves of these for sanitation, and the ph strips make them easy to use properly. Love the small bottles, makes it easy to store! Would definitely recommend. These are great, I have alot of the girls that does not like using bleach, so these are perfect to sanitize the dishes with, highly recommend. These are a basic requirement in my bakery, and this was the cheapest deal I could find for my sanitizing strips. I often use these in my mopping water. The sanitizer tablets are great to have at the store. People really appreciate being able to use these and it promotes good hygeine. We like how disposable they are and they are handy and easy to access. I've used this product 2 ways - first as a sanitizing solution where kitchen utensils were soaked for the appropriate amount of time; and second as a spray-bottle refill to sanitize counters and tables. It works great and is very economical! Very convenient and easy to use sanitizer. Employees or customers sensitive to bleach odor? Give these a try for your final rinse. Tablet form easy to repeat your concentration, day in and day out. I cannot say enough about the Steramine sanitizer tablets. This makes mixing sanitizer for you third bay sink a breeze and simplifies the process. Dries with no water spots but get the test strips to double check the mix ratio. These sanitizer tabls are so easy to use. Only one to two tabs per gallon of water. Easy to store bottles in limited space area. These tablets are great for creating a consistent sanitizer every time. They eliminate the need for measuring and make it easy to train people on how to use. they take time to dissolve, so plan ahead. These tablets are great for food service sanitization use. Not only are they easy to measure out, you can tell once they have been added to the water. There is also no residue left in the sink or on the dishes from this sanitizing method. A great item to have in the food service industry. The tablets are easy to use and provide adequate amounts of solution for my busy store. This is a great buy on Steramine Sanitizing Tablets. Often, you don't want to invest in a case, so Webstaurant Store offers them by the bottle. Perfect for smaller operations who keep low inventory. A great alternative to using smelly bleach water, highly recommended by the health department. Tablets are pre-measured, and turn the water blue, so you don't mistake it for anything else. Make sure to get test strips to use with this during dish washing. We have hard water here and had a problem with spotting, not any more. Steramine works great and we will never use anything else again. Product is excellent and the price is very competitive. Am impressed with the professionalism of the Webstaurant Store and their shipping dept. Keep up the good work and I will continue to purchase the product here.